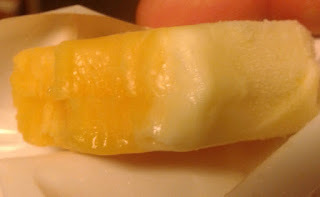 Here's a question I found myself pondering the other night while chomping through a Trader Joe's Mango & Cream Bar: What, exactly, is the divining criteria used to determine whether or not a frozen summer treat will be served on a stick? Is it potential mess factor? Structural integrity? Ease and comfort? I'm not really sure. I get why ice cream sandwiches (whether cookie or wafer ones) are stickless - there's a built-in easy way to hold them that unless you're a toddler (or me) it won't create a mess. Also, Klondike bars with no wooden pole make sense - although the potential mess is through the roof, I think a stick would only exacerbate since it's a big ol' quickly melting rhombus. But, other than that, and excluding ice cream cones (duh) and the cheapie colored sugar water freezy pops, pretty much any ice cream bar or popsicle or anything is a perfect candidate to be plunked on a stick, right? 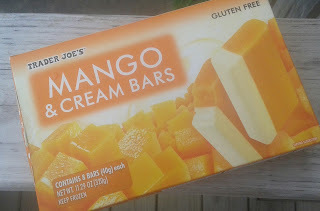 Except....these TJ mango cream bars don't have a stick. They're prop-less and pole-less. Instead, it's just the bar itself, lonely, in a little wrapper just waiting to get all sticky and melty in your little grubs, unless you actually take the care to try to eat it from the wrapper, which seems silly to me. Really, these should be plopped on a little post. Thankfully, though, I won't let that skewer my perception too much. In all, these do make a tidy little treat. Each bar is about 75-80% typical frozen mango-esque popsicle, with the a little side section of smooth chilly cream that complements the rest of the bar pretty well. I'd personally like if the cream and fruit part were a little more intermingled so each could be present in each bite. Regardless, the mango tastes all summer-y and sugary and all that enough by itself to work, but the cream really adds a nice touch to tie it all together. A small side note: Not liking the ingredient list, which I neglected to doublecheck before purchase, mostly because so many TJ's products don't have it that I take it for granted: glucose syrup, with corn in the parentheses. There's a lot of noise online clamoring about glucose vs high fructose corn syrup (here's one link I found - can't vouch for its truthiness) but...I don't know. It sounds too much the same to me, in that tt's added sugar, and in some sort of form that's different from the sugar already mentioned in the list. Seems like a lot of extra sugar, when I think God made mangoes taste the best, personally - nothing extra needed. Anyways, both Sandy and I, and our almost three year old (time flies!) enjoy them enough as is. They're smallish enough to perfectly sized for the kiddo and to not feel like too guilty an indulgence for us big kids. There are other varieties of these bars out there, like raspberry or coffee ones, that I'm sure we'll try before the summer's up. The box of six desserts cost no more than a couple bucks, making it a relatively painless pick up. It'd just be nice if there were a little something that made them a little more special or unique, but alas, these bars are a pretty solid choice as is. Not bad at all. If you looked closely at the bottom of the 2nd photo it says "product of Australia". I find that interesting. http://www.weis.com.au/products/weis-bars. This is the Australian brand. So you was enjoying Weis ice cream bars. There are also instructions that you can push the bar up through the end of the package, and eat it like we used to eat the old fashioned push ups. I find the little rapper just perfect to hold the mass in, and they are just the perfect size, too small to really get very messy.